Netflix has become more ruthless with its content commissions in recent periods, cancelling what it perceives to be under-performing series at a higher-than-ever rate. Series such as The Get Down, Bloodline, Sense 8 and Marco Polo are all titles which have failed to make the cut. Netflix CEO Reed Hastings has indicated that he would like Netflix to be cancelling more shows, hand-in-hand with taking more programming risks. But Netflix's recent spate of cancellations is likely also linked to reversing the declining average quality of its titles. 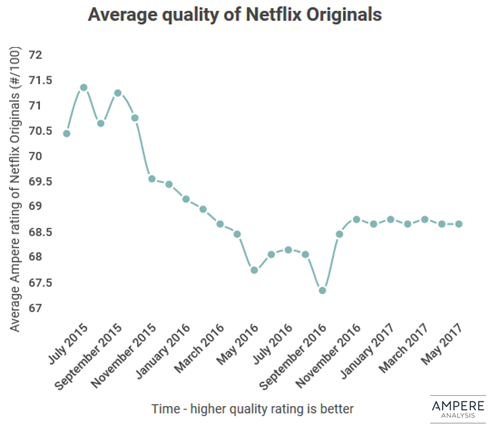 Since 2015, Netflix's catalogue of Originals has dropped in quality by roughly 4%, as estimated using Ampere's own quality measure. The shows which Netflix has cancelled have all fallen below a cost vs interest threshold. 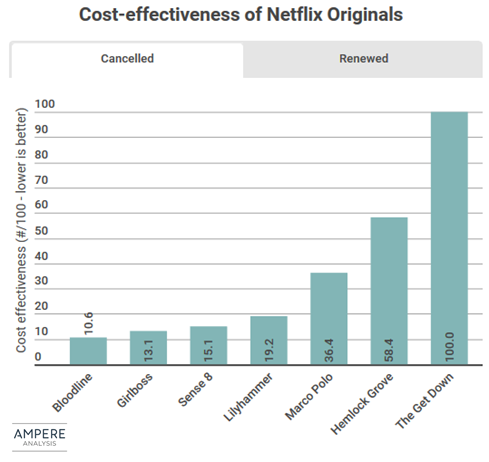 Ampere has calculated a simple cost-effectiveness ratio for Netflix Originals (weighing up show cost relative to the volume of quality-weighted IMDB reviews) which illustrates that Netflix's cancelled shows (with the single exception of Bloodline) all fall below the levels of cost-effectiveness achieved by its renewed titles. On this scale, Stranger Things registers as the most cost-effective series Netflix has released, followed by 13 Reasons Why and by Narcos. By contrast, The Get Down achieved middling interest but commanded a high fee, and was the least cost-effective Original, followed by Hemlock Grove. To interact with the chart, and view both cancelled and renewed stats click here. Netflix has been placing its bets in a few areas. 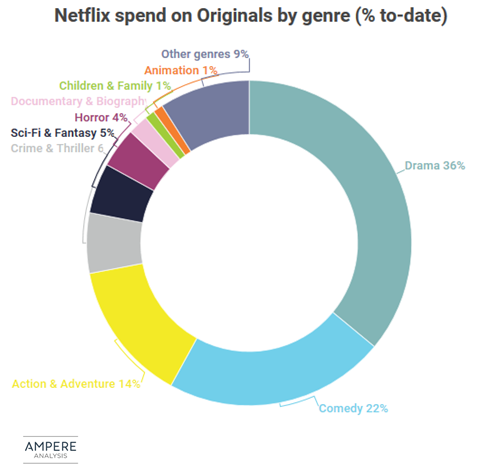 By Ampere's estimates, over a third of the company's expenditure on Originals to-date has been for Drama titles, and nearly a quarter of the company's Original spend has been on Comedy series and stand-up shows. Action & Adventure, Crime & Thrillers, Science Fiction and Horror are also significant areas of investment. Kids/Family and Documentary titles represent important components of Netflix's catalogue, but the relatively low costs-per-hour for the categories - particularly compared to scripted drama and entertainment series - mean that sums spent on these genres have been comparatively low.